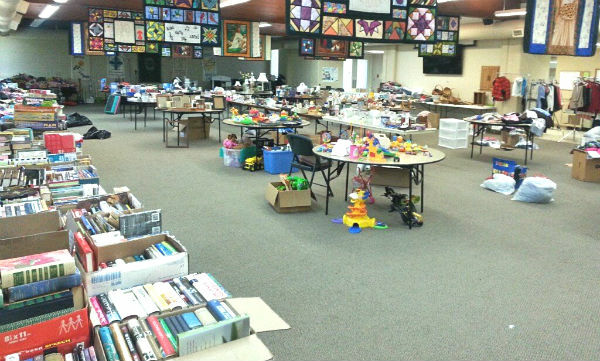 In May the Education Commission hosted their annual rummage sale. Over $1,400 was raised for Christian Education opportunities through St. John’s. Thank you to all who donated, bought, promoted, and worked at this year’s sale! A lot of stuff came in for the rummage sale! More than 30 young people in the St. John’s family are graduating from high school this spring. Those students have an opportunity to be part of a quilt milestone ministry to commemorate this time in their life and remind them that the people of St. John’s continue to pray for them. This year 17 seniors participated in this project. Congratulations to all our graduating seniors! You are in our prayers always. Tagged: education, fundraiser, Messenger 0616, milestone ministry, rummage sale.